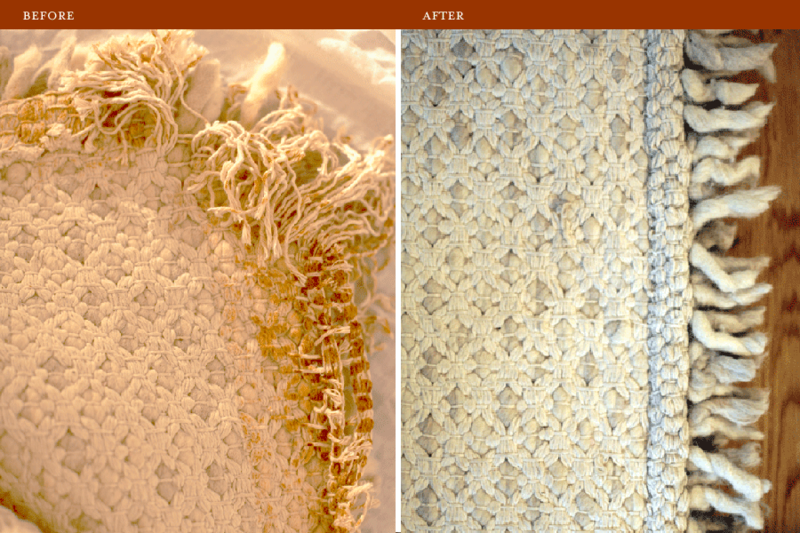 Unlike rug cleaning, set charges can not be determined for rug repair and rug restoration as the cost depends on the amount of labour and materials needed. Once we see your rug and analyse its characteristics such as origin, age, density of knots, kind of fibre, kind of structure, condition and kind of damage, we can then inform you on amount of time it will take and the cost for the job. Our prices include collection and delivery. 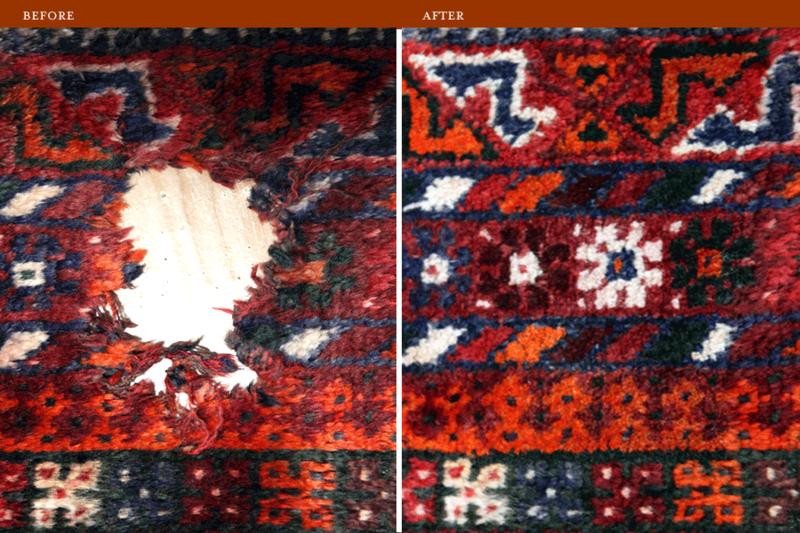 If there is damage to your rug, do not worry, all the wear and tear can be repaired or restored. In most of the cases, good restoration job is invisible to naked eye, even experts can not tell the difference. 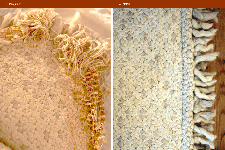 Restoring rugs will certainly prolong their life, with good maintenance, rugs can last for centuries. You should inspect the rugs periodically for insect damage. You can have your rugs treated for moths, carpet beetles and destructive insects. Do not allow the rugs to get wet. If they do get wet, make sure that they dry in the shortest possible time (wet vacuum and a fan can help). Do not use excessive heat to dry wet rugs. Have your rugs cleaned when noticeably dirty and only by a specialist with a thorough knowledge of hand woven rugs and carpets. Do not have your rugs or carpets dry-cleaned or steam cleaned. Have any fraying tears or other damage repaired immediately. If a torn or damaged area is allowed to continue fraying, it can greatly decrease the beauty and value of your rug. With regards to furniture placement, it is a good idea to shift the legs of heavy furniture by a few inches every few months. This will prevent potentially permanent indentations in the rug's pile and provide an additional protection measure. ONCE INSTRUCTED, YOUR RUG WILL BE PICKED UP BY OUR RUG EXPERT AS SOON AS POSSIBLE IF YOU RESIDE IN GREATER LONDON. FOR OTHER PARTS OF BRITAIN, WE USE UPS NEXT DAY COLLECTION SERVICE. PLEASE GET IN TOUCH FOR MORE INFO.